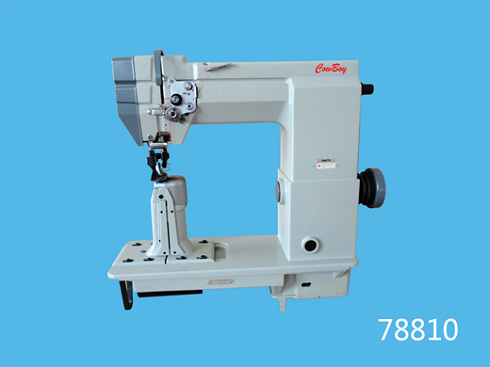 Features: It is the most-advanced upholstery sewing machine which is best-suited to the sewing of heavy weight materials sewing processes such as car seats, sofas and arm chair, leather bags and sports goods; The post bed facilitate the handling of difficultly accessible seam areas, especially decorative stitching corners of furniture covers and car seats; The post bed also reduces operator involvement (sewn piece fall down from the high bed, not pile up together, no need to push manually), thus improve productivity 10%; This post bed sewing machine comes with large Barrel shuttle has been specially designed for processing the extreme thick sewing thread and heavy weight materials; The custom made topstitching presser foot and high system igieł penetration power guarantee easy sewing thick spots or overlapping cross seams; Powerful and effective triple feed system; The high top feed stroke facilitates sewing over thick spots and cross seams; Up to 14 mm long stitches for decorative seams; Excellent stitch pattern, constantly tight stitch formation, even with large Max. 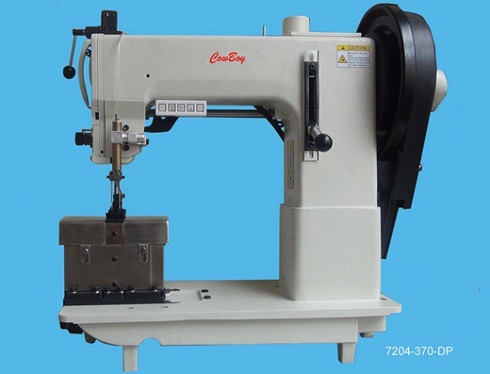 długość ściegus and extreme strong sewing thread; New technology of this machine are optimal conditions for making furniture and automobile upholstery, luxury leather goods and other technical textile articles. 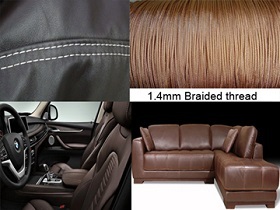 Applications: for assemble and decorative topstitching luxurious leather sofas, armchair, couch lounge, chair, car seat covers, upholstered furniture, shoes, saddles, leather crafts, automotive upholstery, marine upholstery, aerospace upholstery, luggage, suitcase, leather bags and other high-end leather goods. Features: The Adler 204 type extra large barrel shuttle has been specially designed for processing the extreme thread and material thickness of heavy weight materials. Max. metric thread size 7, V415, T-400, 1300dx3 or Amann Serabraid Thread 1400 T60 braided thread can be use without any difficulty; The post bed design gives you greater access and control when sewing decorative (top stitching) & functional stitching on shaped or 3d items, which would normally be difficult or impossible to sew on a standard flat bed machine; Its heavy duty combined triple feeding action by way of: bottom feed, system igieł feed and walking foot top feed, guarantees effective handling of medium to heavy weight materials, leather and fabrics etc; High system igieł penetration power guarantee easy sewing thick spots or cross seams(over transversal seams), without skipped stitch, loose bottom thread, shorten Max. długość ściegu, bobbin thread Knots and Tangles; The sewing foot stroke up to 10 mm allows the safe climbing over differently high material plies; Pneumatic climbing device for excellent stitch formation when sewing over thick spots or overlapping seams; Up to 14 mm long stitches for decorative topstitching seams ; Thread puller is available for even thread tension. 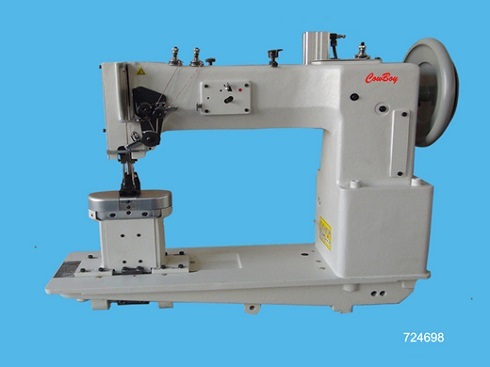 Features: It is custom made sewing machine for thick thread decorative seam (topstitching) in upholstery industry; The double Adler 204 type extra large barrel shuttle is specially designed for processing the extreme heavy weight materials and thick thread (1.4mm braided thread) or Amann Serabraid thread 1400 T60 for coarse decorative seams, particularly suited for hand crafted upholstery, shoes, leather goods, car seats and steering wheel covers; Triple feed mechanism ensures constantly tight stitch formation, even with large Max. długość ściegu; High system igieł penetration power guarantee easy sewing thick spots or cross seams(over transversal seams), without skipped stitch, loose bottom thread, shorten Max. długość ściegu, bobbin thread Knots and Tangles; The sewing foot stroke up to 10 mm allows the safe climbing over differently high material plies; Pneumatic climbing device for excellent stitch formation when sewing over thick spots or overlapping seams; Up to 13 mm long stitches for decorative topstitching seams; Thread puller is available for even thread tension. 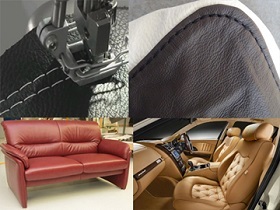 Applications: for assemble and decorative topstitching luxurious leather sofas, fabric sofas, armchair, couch lounge, chair, car seat covers, upholstered furniture, shoes, saddles, leather crafts, automotive upholstery, marine upholstery, aerospace upholstery, leather bags and other high-end leather goods. 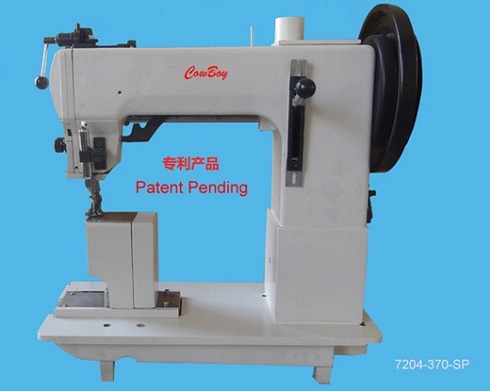 Features: For sewing extra heavy weight materials such as fabric, plastic, leather, webbing, fiberglass, Kevlar, rubber; Compound feed and walking foot mechanism assures even feeding of materials; High system igieł penetration power guarantee easy sewing thick spots or cross seams(over transversal seams), without skipped stitch, loose bottom thread, shorten Max. długość ściegu, bobbin thread Knots and Tangles; The sewing foot stroke up to 9 mm allows the safe climbing over differently high material plies; Pneumatic climbing device for excellent stitch formation when sewing over thick spots or overlapping seams; Up to 12 mm long stitches for decorative topstitching seams; Thread puller is available for even thread tension; Front tape guide is available for double stitch with under tape strengthening, saddle stitch and top stitch; Piping cord insert is available; This machine is an ideal replacement of Durkopp Adler 868-290321 and Durkopp Adler H868-290361. 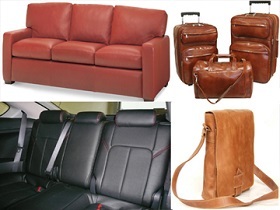 Applications: assemble and topstitching leather sofas and furniture, car seat covers, automotive upholstery/car interiors, marine upholstery, shoe uppers, handbags, jeans, tarpaulins, covers, awnings, tents, umbrellas, luggage, travelware accessories, sports and camping equipment, wearing apparel, outdoor clothing, footwear, foundation garments and orthopedic appliances. 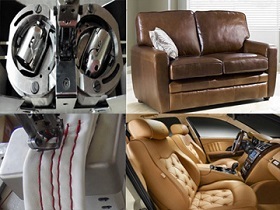 Features: For use in many sections of the heavy duty industry including the manufacture & topstitching of high-end leather sofas and furniture, car upholstery & interiors, leather goods, filters, technical textiles, plastic and laminated products etc. 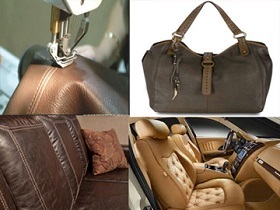 ; The post bed design gives you greater access and control when sewing decorative (top stitching) & functional stitching on shaped or 3d items; Its heavy duty triple feeding action by way of: bottom feed, system igieł feed and walking foot top feed, guarantees effective handling of medium/heavy weight leather and fabrics; Safety clutch prevents damage to the hooks, bevel gears and other important parts; Front tape guide is available for double stitch with under tape strengthening, saddle stitch and top stitch; Optional pneumatic seam centre guide available combined with compensating topstitching presser foot. 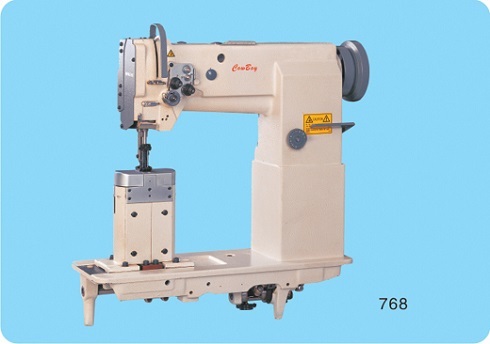 Features: Modern post-bed high-speed seamers for shoe manufacture; The versatile post bed design allows you to stitch hollow, tubular and shaped items; Its Positively Driven Roller Presser provide a powerful feed for the materials which are hard to feed and climbing stitches over thick section, and ensures constant Max. 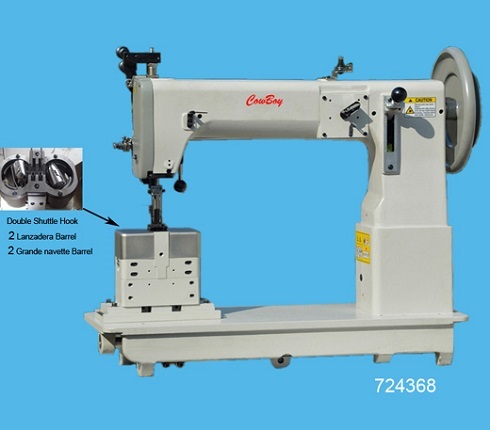 długość ściegu and smooth material feed; The roller foot allows for detailed edge sewing; The large vertical hook with 60% more thread capacity reduces the number of bobbin changes; The machines can be equipped with thread trimmer, automatic presser foot, backtacking mechanism and side cutter (options). 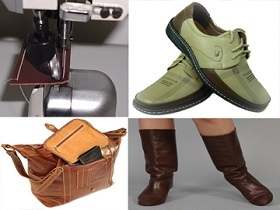 Applications: for ornamental stitches and assembly seams in the manufacturing of shoe uppers, leather bags, leather crafts, handbag, leather sofas, upholstery/car interiors. Copyright 2006© cowboysew.com. Wszelkie prawa zastrzezone.